SOUTH BEND, Ind. (AP) — Senior Dexter Williams has been through countless ups and downs during his four years at Notre Dame. Injury, suspension, an arrest, the emotions of helping his ailing mother — all of it has weighed down Williams at times. 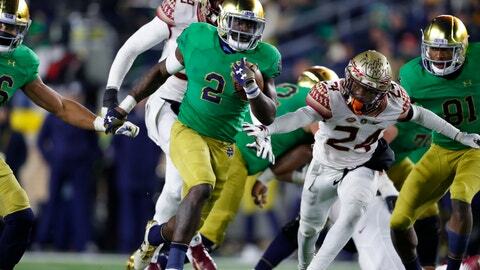 He has emerged just the same as the workhorse running back for the third-ranked Fighting Irish, and a key reason Notre Dame has legitimate hopes of making the playoff. In a 42-13 rout of Florida State last week, Williams piled up a career-high 202 yards on just 20 carries, becoming the first running back to surpass 200 rushing yards against the Seminoles since 1982. Nicknamed “Juice” by his teammates, he had scoring runs of 58 and 32 yards. “I told the offensive line to give me a crease, and I would make a couple of runs for them,” said Williams, who already this season had touchdown runs of 97 and 31 yards against Virginia Tech and 45 yards against Stanford. With four 100-plus yard performances in six games, Williams’ per-game rushing average stands at 128.3 yards, which would rank fifth in the country if he had enough games to be included among the NCAA leaders. His 6.8 yards per carry would be 13th. He leads the Irish with 770 yards and 10 touchdowns, exceeding expectations as Notre Dame (10-0) prepares for Saturday’s game at Yankee Stadium in New York against No. 12 Syracuse (8-2). It took Williams more than three years — and through plenty of adversity — to get to this point. In 2016, Williams was one of five Irish players arrested for possession of marijuana during a traffic stop. An injury cost him three straight games in 2017, and he opened this season with a four-game suspension for violating unspecified team rules. Reflection and maturation helped Williams find his footing, in both school and football. He is expected to graduate next month with his degree in Africana studies. “Just growing up in his maturity, ownership and being accountable and responsible,” coach Brian Kelly said. But a mother’s love, support and sacrifice were equally as important as anything Williams did on his own. Recognizing that her son was hurting as suspension loomed, Dexter’s 60-year-old mother, Cheryl Williams, relocated to South Bend from her home near Orlando, Florida, and moved into an apartment with her son before the season. Mother keeps son on track and well fed. Son watches over mom as she battles two incurable diseases — myasthenia gravis and pulmonary arterial hypertension, ailments doctors say will take her within the next few years. Dexter Williams cherishes every day he shares with his mother, and uses his fresh outlook to lift her spirits and fuel his newfound football success.